This file photo of a Russian Progress spacecraft in orbit shows the location of navigation antennas that allow autonomous flight and docking. On April 28, Russian flight controllers lost control of the Progress 59 spacecraft shortly after it separated from its rocket. The astronauts and cosmonauts on the International Space Station are not at risk of running out of essential supplies, NASA officials said Tuesday (April 28) when a robotic Russian cargo ship suffered a serious malfunction after reaching orbit. Russia's Federal Space Agency, Roscosmos, is currently attempting to regain control of the unmanned Progress 59 cargo ship, which apparently suffered a malfunction after launching toward the space station today to deliver more than 3 tons of supplies for the orbiting laboratory's six-person crew. Progress 59 is carrying 1,940 pounds (879 kilograms) of propellant; about 110 pounds of oxygen (49 kg); 926 pounds (420 kg) of water; and about 3,128 pounds (1418 kg) of dry cargo, according to a statement from NASA. The dry cargo included spare parts, supplies (including food) and scientific equipment. The U.S. supplies aboard the craft include spare parts for the station's environmental-control and life-support system, backup spacewalk hardware, and crew clothing. "There is a minimal amount of U.S. cargo on" the craft, Huot said. "All of it is noncritical, and all of it is replaceable." It is unclear if the ship can be recovered and when it will deliver its cargo to the station. But Hout stressed that Russian space agency officials are working hard to regain control of the spacecraft. "At this moment, Progress 59 isn't lost," Huot said. "The Russians are still continuing to troubleshoot issues with the vehicle, and we're just following along and waiting." The Tuesday launch of Progress 59 went smoothly until shortly after the craft separated from the Soyuz rocket, at which point the Russian flight control team was unable to send commands to the vehicle or receive telemetry data, according to NASA. Video from a camera on Progress 59 clearly shows that it is spinning in its orbit. The craft was originally scheduled to dock with the orbiting outpost Tuesday morning, then shifted toward a docking target of Thursday (April 30), before Russian flight controllers opted to stand down on station-rendezvous plans until they can regain control of the cargo ship. Huot said the orbiting station is currently equipped with more than four months of food and is well stocked with other essential supplies. The private spaceflight company SpaceX is scheduled to send its seventh cargo resupply mission to the space station on June 22 aboard a Dragon space capsule. 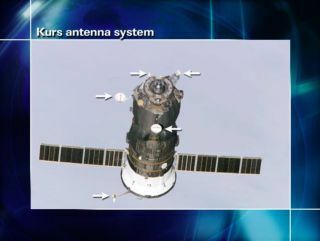 The last cargo craft to deliver supplies to the station was also a Dragon capsule, which arrived at the station on April 17. Russia's Progress spacecraft have been delivering cargo to the space station since 2000, when the first crew took up residence. While the spacecraft have been largely successful, in August 2011, a launch malfunction led to the crash of the Progress 44 cargo ship. There are currently six crew members aboard the International Space Station: astronaut and Commander Terry Virts, cosmonaut Anton Shkaplerov, and Italian astronaut Samantha Cristoforetti have been on board since November and are scheduled to return to Earth in May. Astronaut Scott Kelly, cosmonaut Gennady Padalka and cosmonaut Mikhail Kornienko have been on board since March 27. Padalka will return to Earth in September, while Kelly and Kornienko will remain in orbit until March 2016, as part of the orbiting outpost's first yearlong mission.